The Döner Kebap is most likely Turkey’s most well known contribution to the culinary world. Especially in Germany, döner stands are on nearly every street. Meat roasts on a vertical spit and is shaved into what looks like a tortilla and wrapped up for your tasty enjoyment. 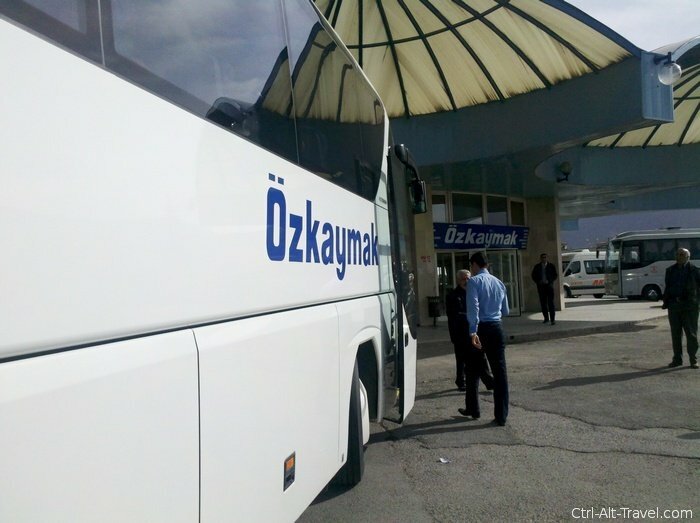 This is what I knew too before heading to Turkey, yet I discovered so many tasty things beyond that. The best part is that living in Germany, Turkish places ARE so common than I can get similar things here too. I just needed to know they existed. 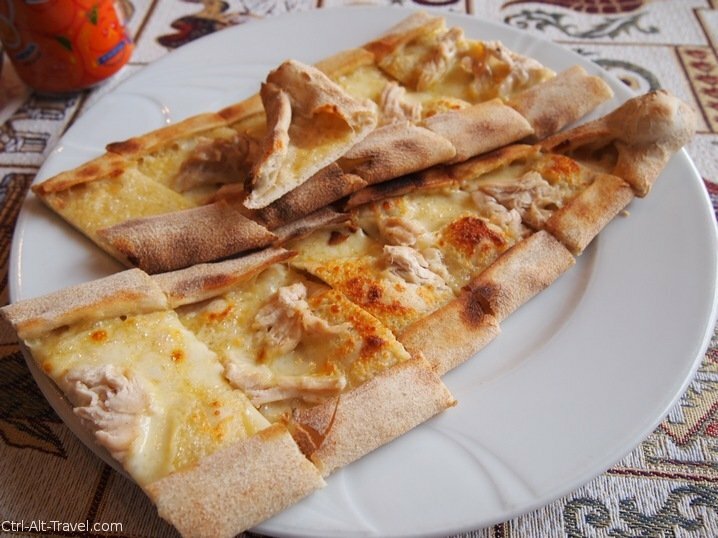 If you want to call a Döner a Turkish Burrito (yes I saw that on an english menu), then Pide is Turkish pizza. Yet it isn’t. The same basic idea holds, flattened bread is covered in ingredients and often cheese and baked in an oven. Pide are long and tapered, almost boat shaped. Pieces are usually cut across. The Peel (that is the fancy word for tool used to move pizza around in an oven) is similar as for a pizza but again long and thin instead of wide. I know it from Greek restaurants back home, but it shows up in Turkey a lot too. Same idea, flaky dough drenched in honey with a few nuts as well. Sugar overload. We stopped at a cafe a few streets from the Grand Bazaar and I ordered some. It came in 4 forms, one being pistachio green. I was hyper for a while. One thing I didn’t realize is that there are different regional interpretations of the Döner. This ended up being my favorite. The town it is named after is on the seaside down near the Syrian border. I have seen it on menus here, but it ends up being pretty expensive while in Turkey is wasn’t any more than any of the other dishes. 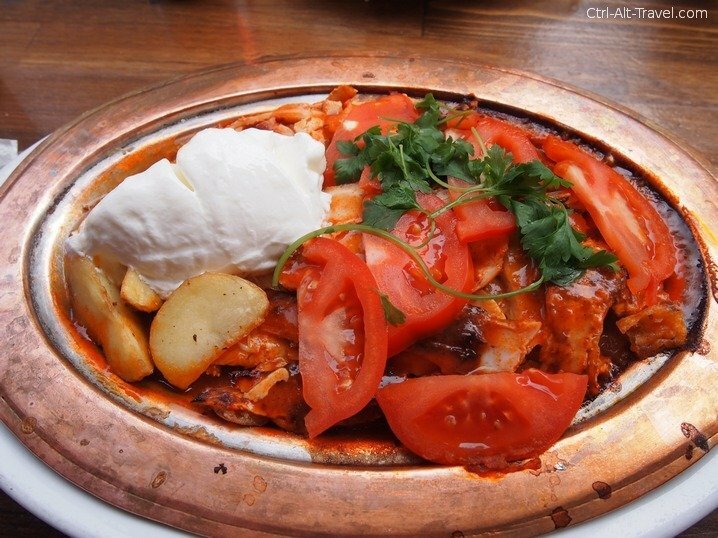 The dish is a layer of bread topped with a mix of tomato sauce, tomatoes, french fries and döner meat. Then depending on the place sour creme. The bread soaks up the sauce and just waits at the bottom of the dish for you. So yeah, there are a lot of things described as Turkish versions of other dishes. 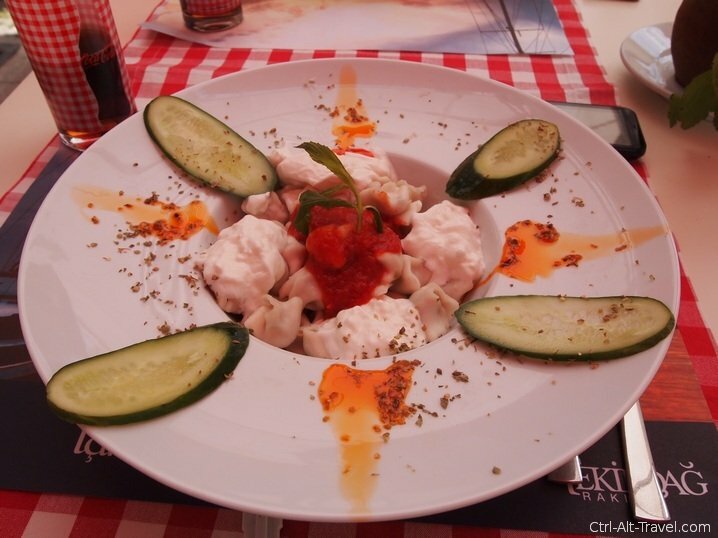 This was described as Turkish ravioli. It was indeed similar, but they are much smaller and the dish is served with yogurt (sometimes cold) sauce. I liked it ok, but not my favorite dish of the trip. For a nominally Muslim country, I was surprised to see beer and alcohol so often. 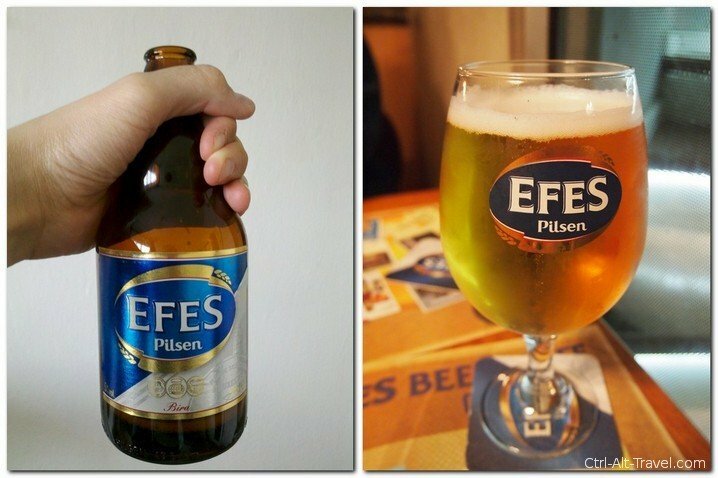 Efes is the beer of choice in these parts. Sometimes it is the only choice, but whatever. It is a light pils style beer named after Ephesus. It is what I call a hot weather beer, refreshing but best served cold. In Cappadocia, once we had ordered at a restaurant they brought us bread. 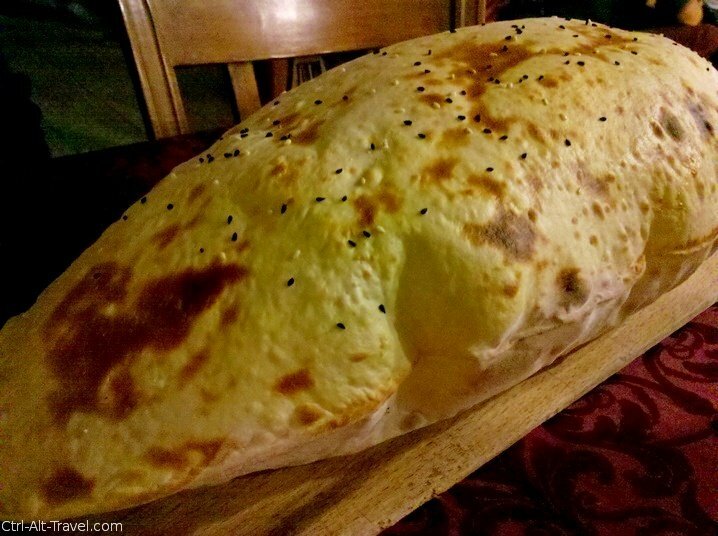 In Goreme, the bread was puffy. It was the size of a watermelon all puffed up with air and warm. Despite the size, the layer was about as thick as a tortilla. Then we got dipping cheese and butter. Slather the butter on the bread so that the cheese will stick. At least this was what I figured out. On our tour out from town, we had an included meal. I never have high hopes for these kinds of meals, but this one was good. The soft thick bread came with three dips. The butter and cheese from before, a yogurt sauce and a pepper dipping sauce. I tried all of them and still liked the butter and cheese mixture the best. It was a salty feta style stuff which just went nicely together. As mentioned above, the Döner is very well known. 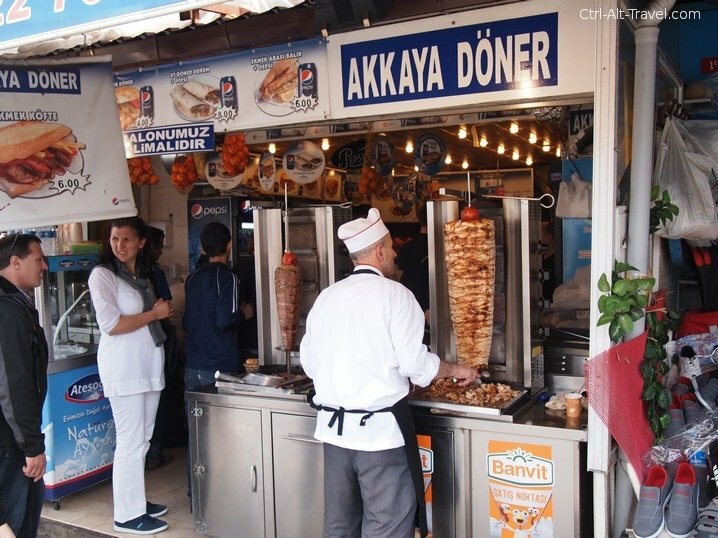 So here is a picture of a Döner stand if you still don’t know what it is. And the moral of the post is.. While the Döner stands are cheap and tasty and well worth trying, there is a whole world beyond just the wrapped meat. What I have shown is even just a small look. 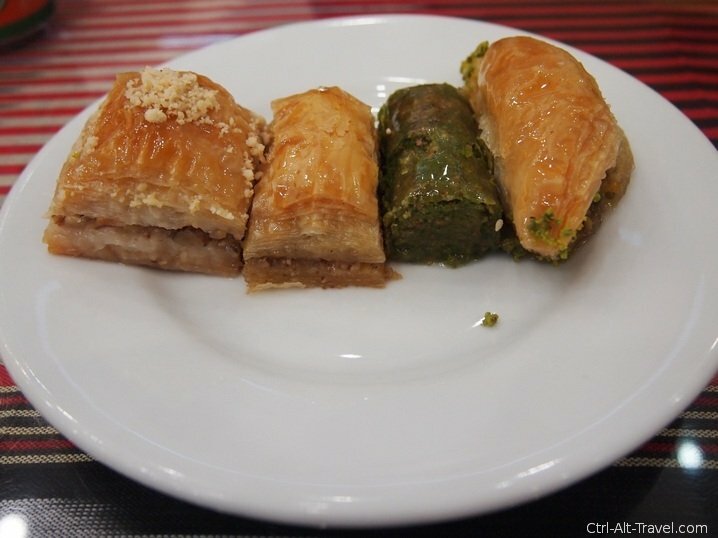 Check out more Turkish Food pictures at Hecktic Travels. And Ali mentions our favorite Kepab shop in Istanbul as well.